Our pound-of-coffee-a-day giveaway is coming to an end as the month of April winds down. There are three more spots to fill on our poster of winners, so if you haven’t won yet, you still have a chance! The next two days will be internet contests, and Monday there’s one more opportunity to be the customer of the day! In honor of our thirtieth anniversary we’ve also created a customer appreciation gift basket–read on below to discover how you can win it! It’s not all games and giveaways around here: we’ve still got a coffee of the week for you. The seasons may be changing–the header photo is of the dogwood blossoms in my backyard–but coffee is good in any weather. Today’s coffee is our Brazilian Cerrado. It comes from the state of Minas Gerais in Brazil, an area in the southeast of the country. If it seems like we feature Brazilian coffees regularly, that’s because a lot of coffee is grown in the fifth largest country in the world. Most of the coffee is not up to our standards: it’s mass produced or of a lower grade than we buy. There’s a lot of robusta in Brazil, and we carry exclusively arabica coffees. But the Brazil Specialty Coffee Association, which you can find online here, has been working hard to improve and promote gourmet coffee in Brazil, and this Cerrado is one of them. This is a full-bodied and nutty bean: a good way to begin your day if you prefer the higher caffeine content of a light roast. It’s easy to drink, without much acidity. If you have not tried our Brazilian in the past, sign-up for our e-mail newsletter (on our Facebook page or our website) to get a coupon for a free cup. Then tell us what you think on our Facebook page, or leave a comment on this blog. We always love to hear from you! In appreciation of all of you . . .
We’ve got one final chance for you to win. There would be no Carolines Coffee Roasters if you weren’t supporting us and drinking our coffee. We want to be sure you know how grateful we are to you, our customers (just in case the chance to win a free pound of coffee every day this month wasn’t enough). 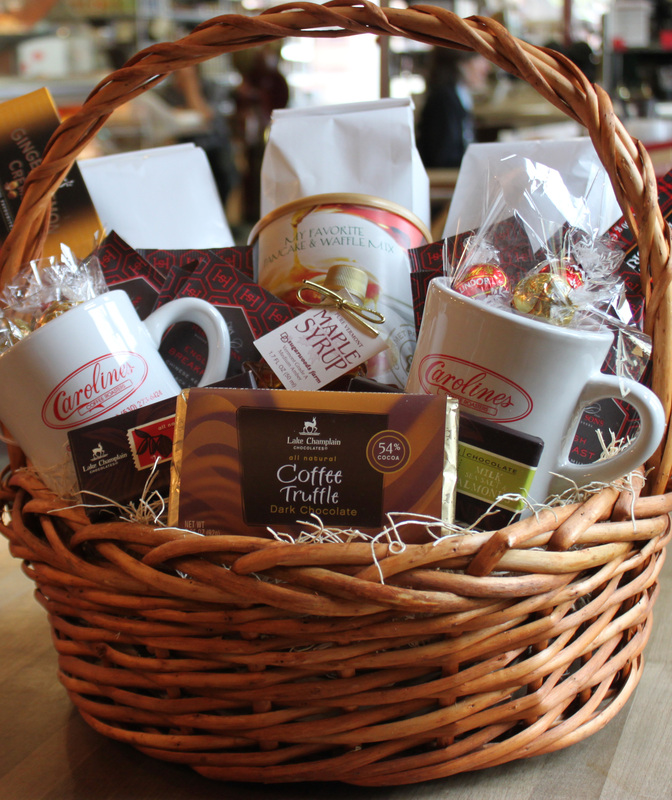 This gift basket is our final thank you to all of you in appreciation of our success for the last thirty years. We’ve included two logo’d mugs, three pounds of coffee, a pancake mix, some tea, and various and assorted cookies and chocolates. To win the gift basket, go to our Facebook page on Monday and leave a comment on this photograph. On May 1st we’ll announce the winner–it’s that easy!